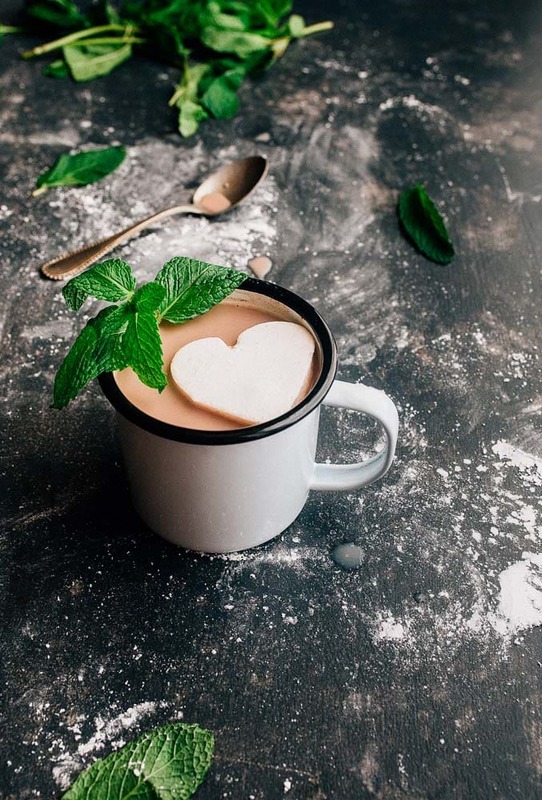 Vanilla mint homemade marshmallows–exactly what your mug of hot cocoa needs! As you know, my Mom is one of the big recipe testers here at Dessert for Two. She’s made pretty much everything on this site (all 680 recipes) with a few exceptions: anything with yeast or anything that requires a candy thermometer. (Though we technically made my kolaches from scratch together, and she makes the skillet pizza for two from my Comfort & Joy cookbook quite often). We all have our hang-ups in the kitchen, and homemade candy is a common one for most people. My personal hang-up is cooking with meat because for some reason, washing my hands 13 times during cooking bothers me more than having to wash 13 pans after making homemade candy. We’re all different; we’re all unique; we all gotta eat. -Once you have homemade marshmallows, you won’t go back to store-bought. -It’s easier than you think: boil sugar to an exact temperature, and then stream slowly it into a stand mixer. -Yep, it’s sticky but you have my permission to lick the bowl and beaters! My Mom and I found ourselves home alone the other day (not really sure what my Dad and husband were up to, but as soon as they leave the house, we switch the TV to Food Network and we jump in the kitchen). I did my best to convince my Mom that the process of homemade marshmallows is easy. I used this special spatula that has a built-in temperature probe to stir, so you don’t even have to use one of those clunky clip-on thermometers. Honestly, a digital spatula with a thermometer has changed my homemade candy making game for life. 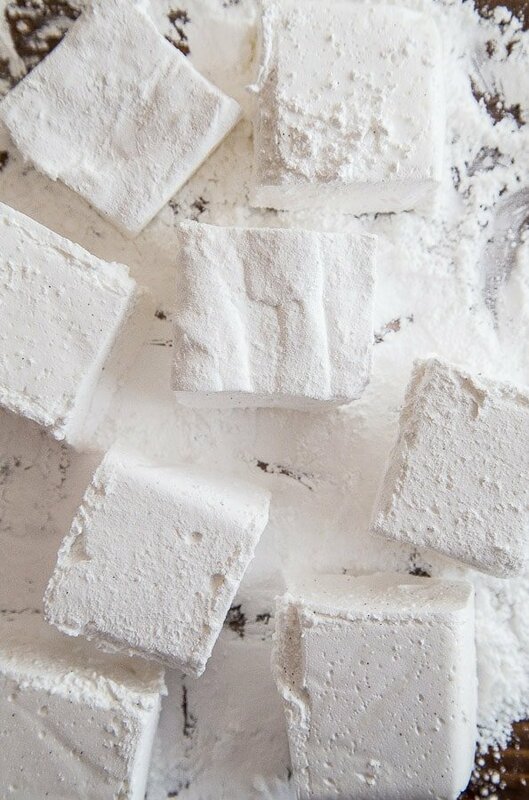 I dreamed of minty homemade marshmallows for topping Camille’s mug of hot chocolate. If there are two things my kid loves it’s hot chocolate and marshmallows! I make her hot chocolate with coconut sugar to keep it slightly more natural, and at times, I make her these maple syrup marshmallows. But today, these are made with white sugar and light corn syrup. You guys know that corn syrup in the store isn’t the same as high fructose corn syrup, yes? Don’t freak on me, please. 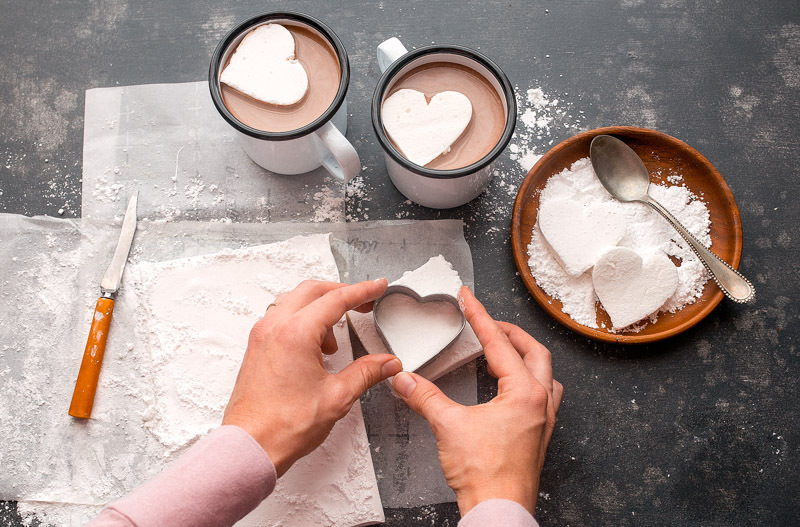 Cutting these vanilla mint homemade marshmallows into heart shapes is just something fun I did for Camille; cutting big squares is so much easier. 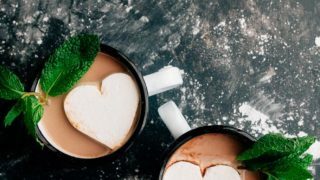 Incidentally, if you want marshmallows in cute shapes and have them float on your hot cocoa long enough to take a photo, you have to make sure they’re thin! I actually sliced the squares in half before I cut the hearts. Use plenty of powdered sugar to help with sticking. Otherwise, slice them into jumbo squares and enjoy! My standard small batch of homemade marshmallows is made in a 9″ bread loaf pan, but if you need a larger batch for the holiday season, go ahead and double this recipe for vanilla mint homemade marshmallows and pour it into a 8×8″ brownie pan. 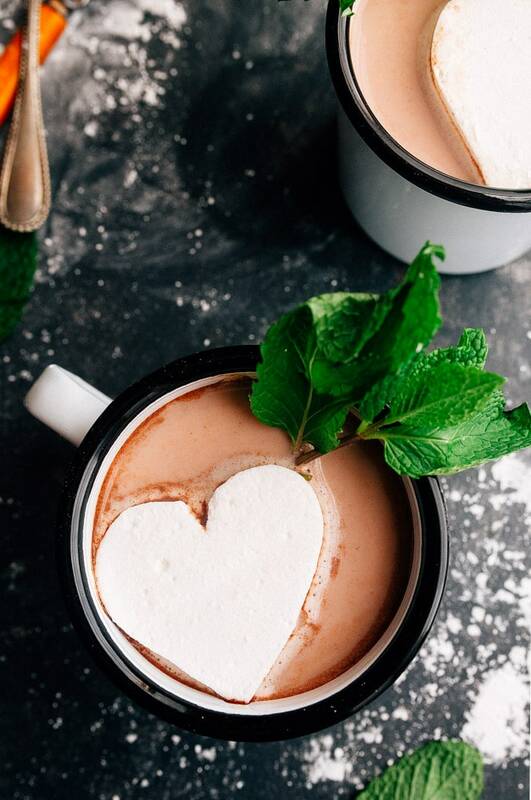 Vanilla mint homemade marshmallows--exactly what your mug of hot cocoa needs! First, line a 9x5" bread loaf pan with parchment paper, and then grease the paper very well. In a medium sauce pan, stir together the granulated sugar, corn syrup, salt, and 3 tablespoons of the water. Turn the heat to high and bring to a boil. Clip a candy thermometer to the edge of the pan (or use a spatula with a built-in digital thermometer in the base), and boil until it reaches 238-degrees Fahrenheit. You may stir it occasionally once all of the sugar dissolves, but be careful not to splash the mixture up on the sides of the pans. (If you do, use a pastry brush dipped in water to brush it down back into the pan). Meanwhile, add the remaining 3 tablespoons of water to a large bowl and sprinkle the gelatin on top. Let sit for a few minutes without stirring. When the sugar syrup reaches 238, slowly begin to stream it into the gelatin mixture while constantly beating with a mixer. Do not splash the syrup on the edges of the bowl, or it will harden immediately. Go slow, and take your time. Beat the mixture for 5-6 minutes, until white, fluffy and very sticky. Beat in the peppermint and vanilla extract, and mix until combined. When ready to cut, sprinkle the powdered sugar on a work surface. Dump the marshmallows out on the surface, and slice while dipping the knife in powdered sugar between cuts. Roll all of the edges of the marshmallows in the powdered sugar. Store the marshmallows in an air-tight container at room temperature. They will keep for 2-3 days . Other small-batch homemade marshmallows from me: vanilla bean marshmallows, raspberry marshmallows, chocolate marshmallows, matcha marshmallows, and maple syrup marshmallows. 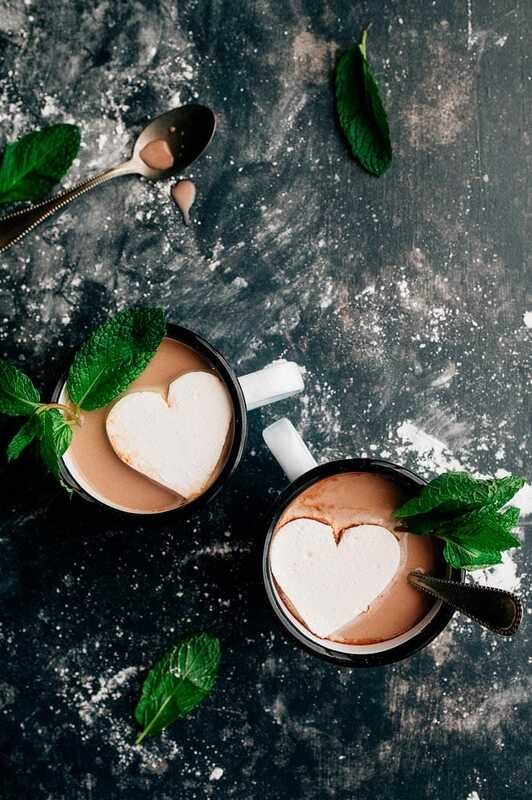 Cuz I wanna have a hot chocolate party with you. yesss candy thermometer and raw meat, they both freak me out. These are so pretty!! I LOVE making marshmallows, but was definitely intimidated the first time. And yes to meat… I’m working on being better, but it requires SO much hand washing! Gah, can you believe I don’t have a candy thermometer?! Gotta get on that. I love love that you put mint in these, so perfect! Being from Germany I didn’t grow up with marshmallows and that might be the reason why I’m not really into them. Anyway, I’ve just tried the store bought ones and never had a homemade marshmallow. And your recipe sounds soooo tempting, I really wanna give it a try! Question on the parchment in the pan: parchment in the bottom only or up the sides also? and … What do you ‘grease’ the pan & parchment paper with? Love your posts. They always make me smile, and I learn something, too. As soon as I find my candy thermometer, I will make these. Happy Holidays to you and your family. Could this be accomplished by using a thinner 9×12 cookie sheet instead of pan? I’m SOOO looking forward to trying these!